The Bristol SU series had a limited following amongst THC Companies. This example is in Ripon Bus Station in July 1968 about to set out on the lengthy run to Masham. I would imagine the Albion 4cyl engine would be quite noisy although probably not as bad as the Gardner 4LK as fitted to the earlier SC series. The SU series had the same gearbox as the earlier SC model and thus parts of the sound were similar on both models. Yes, the Albion Engine was noisy! The interior of the bus version was unusual in having inward facing seats over all four wheels. The Western National coach versions had normal forward facing seats throughout. I remember riding on one or two of these buses on Ripon Market Day services, and I also once spent a day riding on Western National SU’s on various routes centred on Bridport. However I was most familiar with West Yorkshire’s SU models, working from Grassington outstation on service 72 between Grassington and Ilkley, which covered several miles of single-track roads around Appletreewick, and also passed through the narrow arch at Bolton Abbey. I was lucky enough to ride on an SU at this years Kingsbridge Running Day, which brought back happy memories. The geographical area covered by United was vast, and obviously not every type of vehicle would be based at every depot. If any of the depots which ran services into Newcastle had any, they must have been used for local services as I cant ever remember seeing any of this type in the City. Don I was at Ilkley depot in 1960/1 and worked on the Grassington service (which was 75 in those days). It was a lovely route as you say, but roadwise dreadful with dry stone walls, no kerbs or verges, Bolton Abbey Arch, Barden bridge, and hordes of motorists and others towing large caravans – many such drivers seemingly with not the vaguest idea of the dimensions of their vehicles. The famous West Yorkshire Bristol L/ECW saloon SG 103, converted by the Company to forward entrance OPO, was the basic performer on the full length weekday journeys on the route for many years. Very happy days indeed !! Chris, many years later I would be a regular driver on what was by this time the 76 running between Skipton and Grassington via Bolton Abbey, covering the one time Ribble route from Skipton to Bolton Abbey and part of the original West Yorkshire route. Sadly by this time Leyland Nationals were in use on the service, but the scenery and the roads and bridges were still the same. Happy days indeed! The Bristol SU was noisy. The afternoon school special to Eldwick from Bingley Secondary Modern & Technical School was operated by a bus from the Keighley-Bingley via Morton service. Invariably this would be a Bristol SUL – from KSMA 1-4 or SMP 17. My over-riding memory of them is that the ride was hard and the engine extremely noisy. Mind you, what I’d give to ride on one today! 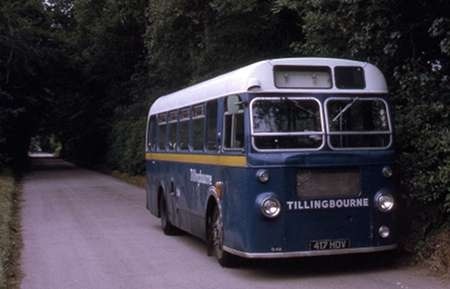 Don, not to digress too far, but during my time at Ilkley service 76 was my all time favourite – five hours a round trip – Skipton, Ilkley, Harrogate, Wetherby, Tadcaster – shared by Skipton, Ilkley, Harrogate and Wetherby depots. There was, however, one phenomenal outing for Grassington crews who used the Skipton depot bus for one round trip with, I think, a 71 from Skipton to Grassington before and after – or maybe they rode passenger to and from Grassington – its a long time ago now !! Picture here of dear old SG 103 – a rare treat for passengers to share first hand the glorious symphony of the Gardner 5LW, and no excess fare either !! Apologies for diverging from the United topic, but this is in a similar vein I feel. Ah, Roffey Corner, Roger; shades of Basil Williams’ Hants and Sussex empire! The service from Grassington to Ilkley is now run by Pride of the Dales using Optare Solos which fit through the Bolton Abbey arch comfortably. Grassington depot is now a postal sorting office and the car park boasts a small bus station. Some 30 years ago I was travelling between Appletreewick and Grassington when I met a WYRCC RESL on a school journey coming the other way we passed with inches to spare in a passing place, I never knew until then how many rivets ECW put in a bus! Even further back in the mists of time in the sixties I once caught the bus from Grassington to Kettlewell on this occasion the bus was packed as it was market day. The bus was a LS and carried a very vintage guard presumably from Grassington depot. Happy days. Many of the Western and Southern National SUs worked on Guernsey for a number of years following withdrawal on the mainland. The SU was designed to meet a requirement for small buses at the start of the 1960s by Western/Southern National to replace rebodied pre-war Bristol L types. Unfortunately, by that time all the other Tilling companies with such a requirement (Lincolnshire, Crosville and Eastern Counties, which had not generally rebodied their pre-war saloons) had re-equipped with the Bristol SC4LK in the mid 1950s. As a result, Western/Southern National took 133 out of the 181 SUs built, and the balance went in only small numbers (often 5 or 6) to other Tilling Group companies. Of these, West Yorkshire had the largest number, taking 18, but these were then scattered around the depots – for example the allocation on 1 January 1965, the first day that all 18 were in service, was Grassington (1); Harrogate (2); Ilkley (1); Keighley (2); Malton (2); Pateley Bridge (2); Skipton (1) and York (1 + 6 York-West Yorkshire). This guaranteed that the type was regarded as an "oddity" at every depot, and we all know what drivers think of oddities…. I know that at York, drivers admitted to using the (fairly inadequate) brakes more than necessary so that they were able to book it off after the morning peak, for the brakes to be adjusted. The Western/Southern National drivers HAD to accept them, by virtue of the quantity in the fleet, and so no doubt they learned how best to drive them, and how to get the best out of them. As one of the small, elite band of SU owners and drivers in 2014 I can confirm that on the level (and downhill!) they have a respectable turn of speed. On a suitable road or Motorway a steady 50-55 mph can be maintained all day long, making long distance rallying enjoyable. Hills are more of a problem; the small engine itself isn’t the whole story, though, as the David Brown gearbox has an unfortunately large gap between 3rd and 4th gear, which guarantees that once down to 3rd gear it remains in that, at 25 mph, until the top of the hill is reached! Like Ken I am an unashamed SU fan and wouldn’t change mine for anything else. Ken says he prefers the shorter SUS model. 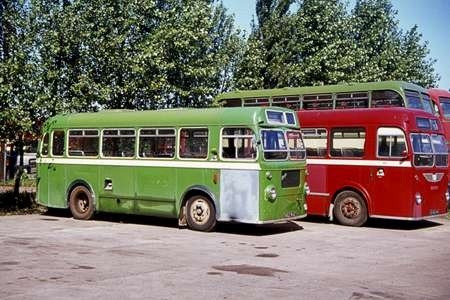 The Bristol Omnibus Co. had nine of them – in three batches, and here is their former 301 (862 RAE), a SUS4A with ECW B30F body, one of three new in 1962. Withdrawn in 1971 it passed to North’s, the dealer, of Sherburn-in-Elmet in Yorkshire at whose premises it is pictured here in 1972. It then saw service with Primrose Valley Coaches of Filey and later Phillips of Shiptonthorpe with whom it lasted until around 1983. It then passed to a Barnsley breaker, but was reprieved and after a few more owners it was last reported as preserved by Mike Ellis of Stroud – 301’s original allocation when new. 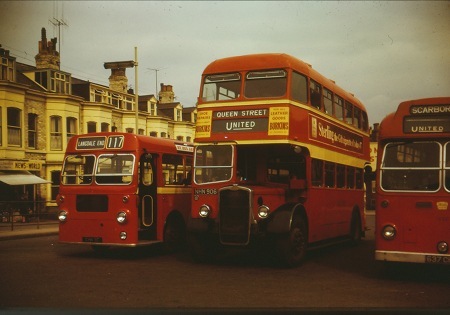 Here we have a line up of three United Automobile buses in Scarborough bus station. the one in the centre is as the specification above having a Bristol AVW 8.1 litre six cylinder diesel engine. 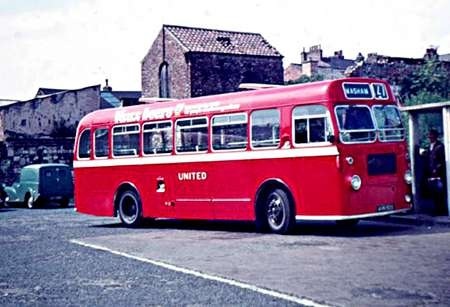 In 1965 all United double decker buses had the Bristol engine, 20 had been converted from Gardner 5LW engine I think they needed the power of the Bristol engine. The bus on the right or should I say half a bus is a 1956 Bristol LS5G registration 637 CHN fleet number U237 with an ECW B41F body. There is a much better shot of a United Bristol LSG here. NHN906 was the last surviving Bristol K6B in the United fleet. There were half a dozen of them at Scarborough for many years for use on the town services there. After they were displaced by new FLFs in the mid-sixties, they moved north to Northumberland. BH1 &2 (NHN 901/2) went to Whitley Bay where they were mainly used on the Whitley Bay town service. BH3-6 (NHN 903-6) went to Ashington. When United renumbered their fleet into an all numerical system at the beginning of 1969, there were only two survivors, BH1 & 6 which became 51 & 52. NHN 901 probably never operated with it’s new number. It was still in service in December 1968, but a few days into the new year, I noted that it was parked out of use behind the depot at Whitley Bay. NHN906 at continued for a few more months at Ashington. I occasionally saw it in the 444 from Bedlington to Ashington via North Blyth. It also sometimes appeared as a substitute for an FLF on the Newcastle services. It appears to have been taken out of service in June 1969. Small correction to the original text. The SU had a five speed constant mesh (not synchromesh) gearbox. Behind the apparent uniformity of vehicle types in the Tilling fleets of the time lay a difference between operators in the engine choice. Some would not countenance anything other than a Gardner in double deck and large saloon orders. Others were happy to accept the Bristol engine which was cheaper to buy and speedier in delivery. Gardners were highly sought after by many manufacturers, and output was not particularly high. In retrospect, it testifies to the ultra conservative iron grip that Hugh Gardner maintained upon the company that production methods barely altered for over 50 years from the introduction of the LW series in 1931. Given the apparent insatiable demand for the Patricroft products, Gardner rested on its laurels, and no real effort to increase output was properly addressed. Back then, the idea that Gardner would ultimately cease to exist was inconceivable.